Jorge L. Rodriguez got tired of being wheel clamped by traffic wardens, so he built some retro-steampunk transport they would have a few problems with. If this is real and if you could make it run, this so over the top steampunk that I’m in total awe of the engineers that created it. Yes, very cool looking but also very faked. The lower half is what seems to be a M60 MBT that going by the concrete hardstand is either a gate guard or part of some outdoor display. The train has been scaled to fit over the top. Remember that with a tank that size the top of the tracks is normally about shoulder level. Scaling from that means you average crew man would get lost in the crew cabin and not be able to reach the three steps on the side of the boiler. Even if it wasn’t faked it would be a static object only. The tank has drive sprokets at the rear while the train has the pistons at the front. 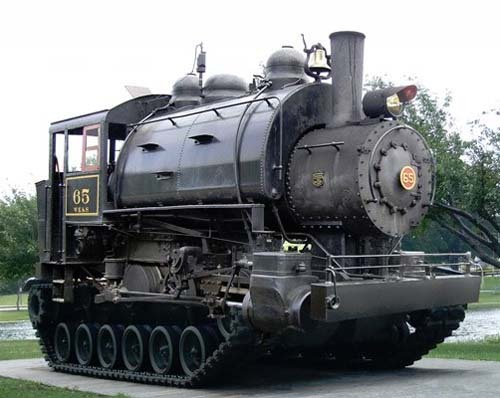 While I am not saying you can’t build a steam powered fully tracked vehicle, it wouldn’t look like this. What an absolutely fantastic Steampunk Contraption!